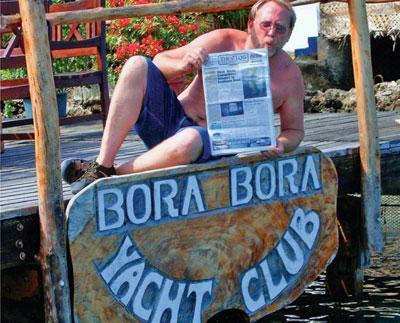 Chris Loftin took The Log along as he relaxed at Bora Bora Yacht Club. Loftin crews aboard Funatic, a Choate 48 out of Channel Islands Harbor. Ã¢â ¬Å“Every January, we charter yachts in the Caribbean,Ã¢â ¬Â Loftin said. Ã¢â ¬Å“We sailed to Bora Bora on a beautiful reach in crystal clear water and hung out at Bora Bora Yacht Club, where we had drinks and some of the best food in French Polynesia.